Guernsey No. 49 (1988 - 1989). 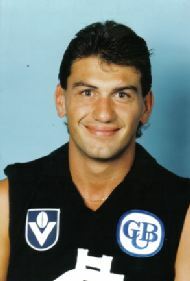 Poursanidis was seen as a key forward prospect when he was recruited from the Paramount Football Club in the mid-eighties, he would play two seasons with the Carlton thirds and captained the team during the 1987 season. The highlight of his time at Carlton came when he kicked eight goals in a Reserves Grand Final win in a twenty point win against the Saints. He was given three senior games at full-forward over 1988 and 1989, but could only manage three goals. Although he was a good mark, he was considered only as a full forward and unfortunately was never tried in other positions. He made his debut in the same game as Gerard Butts and Michael Garvey. Poursanidis would later play a season at VFA club Preston before hanging his boots up at the age of 25. Contributors to this page: Bombasheldon , Jarusa , molsey , tmd1 , dgreen2 , true_blue24 , WillowBlue , PatsFitztrick and admin . Page last modified on Monday 26 of February, 2018 21:20:52 AEDT by Bombasheldon. 1986 GF - Players profiles (page 1 of 2). 1995 Rd 10 - Justin Madden in ruck contest against Hawks.